Size of this PNG preview of this SVG file: 800 × 425 pixels. Other resolutions: 320 × 170 pixels | 640 × 340 pixels | 1,024 × 544 pixels | 1,280 × 680 pixels | 1,995 × 1,060 pixels. English: Diagram of Schrödinger's cat thought experiment. 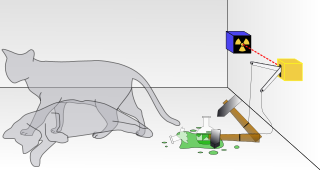 Roughly based on Schroedingerscat3.jpg. This diagram was created with Inkscape. current 22:44, 31 July 2010 1,995 × 1,060 (37 KB) Beao Cleanup and removed border. Introduction à la mécanique quantique/Interprétations de la mécanique quantique.